Supermarket giant Tesco and wholesaler Booker have asked the UK competition regulator to fast-track its probe into their proposed £3.7bn tie-up. Tesco announced it had agreed to buy Booker in January and the Competition and Markets Authority (CMA) started an initial review in late May. The firms now want the CMA to move "more quickly" to probing the merger through an in-depth "Phase 2" process. They expect the CMA to issue a decision to refer to Phase 2 within two weeks. The CMA is assessing whether the proposed grocery tie-up could reduce choice for shoppers and for small stores supplied by Booker. The first phase of its CMA investigation had been due to run until 25 July, but that could now be wound up within 10 working days in advance of instigating the more detailed investigation. The statutory timetable for a Phase 2 inquiry would be 24 weeks, the CMA said. The fast-track process has been used in a number of CMA merger investigations previously, including that of telecoms firms BT-EE and also during the tie-up of bookmaking firms Ladbrokes and Coral. What does Booker Group do? Booker is the UK's largest food wholesaler and also owns the Premier, Budgens and Londis store brands. Despite rising competition from the likes of Aldi and Lidl, Tesco remains Britain's biggest supermarket. 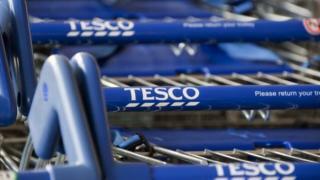 The CMA could force Tesco to sell stores if it believes the deal will harm competition within the industry. When the merger was announced, Tesco and Booker said they did not expect it to be completed until late 2017 or early 2018, suggesting both companies expected closer scrutiny from the watchdog. In March, one of Tesco's biggest investors, Schroders, warned about the cost of the deal, telling the BBC that the supermarket giant was paying a "premium" and it had "major concerns" about the deal.